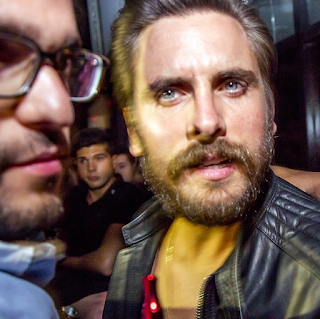 Scott Disick shows up a drunken mess for a club hosting gig in Canada. He has been trying to stay on the straight and narrow when it comes to his partying. But Scott Disick appears to have fallen off the wagon again after he turned up to a nightclub meet and greet on Saturday in Montreal, Canada, so inebriated he was unable to be introduced to fans. The event at Time Supper Club venue was held to raise money for the ONEXONE $1 Feed a Child Campaign. But it descended into chaos when punters demanded refunds on their $250 tickets and was then raided by the police. Marketing Director for the nightclub Thierry Havitov told the Daily Mail Scott, 32, who was given a five figure sum for his appearance, didn't turn up until gone midnight. A source told In Touch: 'Scott was belligerent and refused to do the meet and greet, which meant organisers had to give all the money back. According to onlookers who branded him 'a drunken mess', he went straight to the VIP section and began drinking with his entourage. The source added they saw him downing shots and champagne, and then kept moving from place to place around the venue. Thierry confirmed Scott had to be taken to a number of different areas because the venue was so crowded, and they couldn't get a clear area to carry out the meet and greet properly. 'They got to see Scott but they didn;t get to meet him. Scott moved around a little bit. We took him to the DJ booth and then upstairs. Because it was late it was so packed we didn;t have a clean area. As guests began to get angry they were not getting their money's worth from the meet and greet, two girls in the venue broke into a fight and started pulling each others hair, screaming and crying. Then police raided the venue - the third time in three days. Theirry said he moved the VIP guests to safety and ushered Scott out of the back door: 'When the police raided the venue we decided to take him out because we didn't know what the police were going to do. all this for him? People don't have better things to spend there money on?